These e-cigarette reviews are written for people looking for the best electronic cigarette or looking to buy e-cigarettes. They are combined for two categories of e-cig, those with no nicotine - and those that give you a choice between nicotine and no nicotine. If you want an electronic cigarette review for just one category, you can click the appropriate link in the right column. The Smoking Section: 4.5 out of 5 based on 124 ratings. Quick summary: A technically sound e-cigarette that is middle-of-the-road in terms of price and vaping experience, with a large selection of flavors. Ozone Smoke is a solid electronic cigarette, with a nice feel to it. The draw is similar to some of our highest-rated e-cigs; we found the vapor clouds to be in the middle of the range of products we’ve sampled, and the throat hit better than average now that they’ve increased the power of their batteries – not top-of-the-list, but not lacking either. 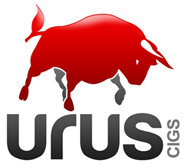 Quick summary: Urus Cigs have a few nice innovations like the carrying case – and our panel enjoyed several of their flavors. We did find they were a little harder to draw on than our top-rated ecig brands, though. When we opened our Urus starter kit, we were immediately pleasantly surprised. The battery, three cartridges and USB charger all came in a thin, sleek plastic case that’s contructed similarly to a hard pack of cigarettes. It’s easy to handle and easy to tuck into a pocket or purse. A number of other products come with optional carrying cases, but this struck us as the perfect blend of functionality and form; metal might be a little more aesthetically pleasing but would be too heavy. The plastic works just right. Urus also has a “premium” starter kit which comes with an extra five cartridges and an AC adapter. Quick summary: Bedford Slims Vapourettes are a decent middle-of-the road e-cigarette, but without some of the features we look for in an electronic cigarette. They’re also not slim. They do offer an option to start with their system very inexpensively, however. When we agreed to review Bedford Slims Vapourettes, we expected to receive one of the first slim and stylish e-cigs we’d ever seen. What arrived, however, was a typical electronic cigarette: it was indeed stylish, with a black pattern design on the battery and all-black cartridge – but the diameter is the same as a standard e-cigarette. We believe the design would definitely appeal more to women, but not to those in search of a “Virginia Slims” look. Putting aside the question of the silver carts, Nuvo is a middle-of-the road ecig, with a decent throat hit and a moderate amount of vapor. They have lots of choices once you move up the price ladder a bit. There are also some nice options in terms of carrying cases and chargers. Quick summary: In a nutshell, Frii is simple, efficient and satisfying. A good combination – a solid choice for those who are looking for an e-cig with nicotine. Simplicity, efficiency and price are the reasons we look favorably on this product. Frii has no hazardous chemicals, and literally allows you to control how much nicotine you’re taking in. No tar, no carbon-dioxide. Whether you’re trying to kick the habit, or you’re not ready to “give in” to smoking restrictions, Frii will accommodate you. Quick summary: Their long-lasting cartomizer (atomizer) is one of the best values that we’ve found, and that makes them worth a look for those looking purely for nicotine-free e-cigarettes. 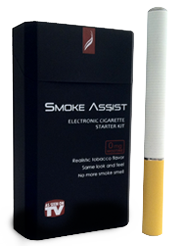 Smoke Assist products contain only water, propylene glycol, and a scent that imitates tobacco flavor. No tobacco, no tar, and unlike most of the competition, no nicotine. They’ve been toxicologically tested and contains no known ingredients considered to be cancer-causing agents. Quick summary: Our panel split on Victory Electronic Cigarettes; some liking the taste and others thinking it was merely acceptable. What they agreed on was that the AC adapter didn’t work well, requiring the ecig to be charged by USB. Choices and options are also limited. Victory Electronic is one of those brands that we found to be “just OK.” It gets the job done at a reasonable price, but nothing really stood out to our panel. Battery and cartridge life seemed to be about average, a couple of our tasters liked the tobacco flavor but otherwise feelings were that the taste wasn’t memorable. Quick summary: we see this as the equivalent of generic cigarettes – but with a very nice offer for a free e-cigarette when you buy the cartridges. EZ Smoker is another one of those e-cigarettes that hits you over the head with a great introductory offer for a solid product. The e-cig is a two-component device, with two flavors available – tobacco and menthol. It also comes in one variety: no nicotine. The vapor cloud isn’t the biggest nor the smallest you’ll find, and the inhale isn’t the harshest or the smoothest available. That makes it a technologically sound, no-frills, option for those looking for an e-cigarette without all of the bells and whistles, and without any of the nicotine. 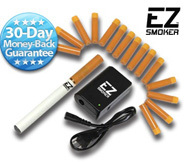 EZ Smoker looks very much like a traditional cigarette, with a brown filter and red LED tip; their cartridges last for the equivalent of a pack-and-a-half of cigarettes, right around the mid-range of the brands we’ve reviewed. Again, sound and no frills. New York City Mayor Michael Bloomberg, as one of his final act before leaving office, has signed the law banning the use of electronic cigarettes indoors in that city. NYC’s “Smoke Free Air Act” now applies to e-cigarettes as well as tobacco cigarettes, which means their use is banned in restaurants and bars, offices and city-owned parks and land. The signing didn’t come without a bit of theater; immediately after the mayor inked the law, two pro-smoking activists lit cigarettes inside City Hall to protest. One was Audrey Silk, the founder of the group “Citizens Lobbying Against Smoker Harassment,” known as CLASH. Both smokers had their cigarettes seized by security, and were ushered outdoors. Many municipalities and states have passed ordinances or laws regulating the use of e-cigs. New York City, as the city with perhaps the most stringent anti-smoking laws in the United States, now has one of the strictest anti-vaping ordinances in the nation. The push to apply anti-smoking regulations to e-cigs seems to be gaining traction at the local level in the United States. The most recent examples are in California, where the city of Richmond (near San Francisco) and the city of Carlsbad (near San Diego) have moved forward on proposals regulating the use of electronic cigarettes. Richmond’s City Council has unanimously okayed an ordinance banning the use of ecigs in all “enclosed” public spaces – even open-air parks. Meanwhile, the Carlsbad City Council has given initial approval to a proposal that bans vaping anywhere where smoking is prohibited, including outdoor seating areas at restaurants. Those actions come as the California county of San Bernadino has banned electronic cigarettes from all county facilities, following the example of nearby Riverside County which last year approved a similar law. Across the country, meanwhile, a committee of the New York City Council held its first hearing on a proposal which would ban all e-cigarette use in public places. Most proponents of the restrictions cite a recent Centers for Disease Control study which showed the use of ecigarettes up sharply among middle school and high school students. However, electronic cigarette supporters charge that the CDC sensationalized their news releases on the study, and didn’t highlight the fact that nearly 75% of the students using e-cigs had previously been regular tobacco smokers.